Senate Floor. The Senate held two cloture votes Monday evening on a disaster relief supplemental appropriations package, but because Democrats and Republicans have not yet come to an agreement on how to proceed, both votes failed. Democrats want more funds for Puerto Rico and President Trump objects to including aid for Puerto Rico in the package. If an agreement can be reached later this week, the measure could be considered the week of April 8. On Tuesday afternoon, the Senate will hold a cloture vote on a resolution changing Senate rules for the consideration of certain nominations. That vote is also expected to fall short of the necessary 60 votes, at which time Majority Leader Mitch McConnell (R-Ky.) plans to use the “nuclear option” to proceed. By using this option, which was also used by Majority Leader Harry Reid when Democrats controlled the Senate, McConnell can push through a rules change with only majority support. The rules change would reduce allowable debate time on certain judicial and executive nominees from 30 hours to as little as two hours. House Floor. Last week, Senate Republicans tried to put Democrats on the spot by holding a vote on the Green New Deal resolution. (The tally on the procedural vote was 0-57, with 43 Democratic Senators voting “present.”) On Tuesday, House Democrats will return the favor by voting on a non-binding resolution critical of the Trump Administration’s support of a lawsuit to overturn the Affordable Care Act. Even though the President tweeted last Tuesday that “The Republican Party will become ‘The Party of Healthcare!’” Congressional Republicans were surprised when the President called on them to draft a replacement plan for Obamacare. The President’s proclamation followed the announcement late Monday, March 25, that the Justice Department would now support invalidating the entire ACA. Acting White House Chief of Staff Mick Mulvaney, who many believe was instrumental in the President’s latest health care push, said Sunday that the Administration plans to send a short summary of its health care principles to Congress as the basis for potential legislation to replace the ACA. While Mulvaney certainly has the President’s ear, the Washington Post reported that it was Sen. Lindsey Graham who revived the topic while he and the President were playing golf in Florida. Joint Session. The House and Senate will meet in a joint session April 3 at 11 a.m. to hear from Jens Stoltenberg, Secretary General of the North Atlantic Treaty Organization. FY 2020 Spending. On an 11-9 party-line vote, the Senate Budget Committee March 28 passed an FY 2020 budget resolution that may never reach the Senate floor. The chairman of the House Budget Committee meanwhile has been unable to round up a consensus among Democrats for a budget resolution and instead will mark up legislation Wednesday that will just set top-line spending numbers for this year and next. The proposal has not yet been unveiled. Both panels have been hamstrung to a certain extent by the current caps on spending that would require drastic reductions on both the defense and non-defense sides of the ledger. In general, there is bipartisan support for increasing the caps, and the House Budget Committee's proposal will set out the Democrats' opening bid in that process. However, President Trump reportedly sees no reason to negotiate with Congress on new caps, believing that (a) the Pentagon budget can be boosted with funds from the Overseas Contingency Operations account, and (b) non-defense spending should be cut. 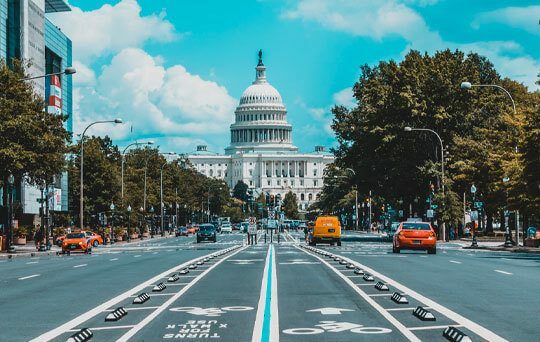 The President’s position is not shared by a majority of lawmakers, so it remains to be seen what the path forward is for the FY 2020 appropriations bills. House Ways and Means Committee markup of bills to expand retirement savings and make changes at the IRS. Democratic Primary Debates. The first of 12 Democratic Presidential primary debates will take place in Miami on June 26 and 27. The two-night event, to be broadcast on NBC, MSNBC, and Telemundo, will be open to candidates who have received donations from at least 65,000 donors in at least 20 states or poll at 1 percent or more in at least three polls. If more than 20 candidates reach one of those two qualifications, the top 20 will be selected by using a separate method that rewards contenders for meeting both thresholds, followed by highest polling averages and then the most unique donors. Candidates will be chosen at random for each of the two nights. This method of selecting who will be on the debate stage is now meeting backlash from some candidates and voters who want to hear what all candidates have to say. Former HUD Secretary Julian Castro, Sen. Kirsten Gillibrand, Gov. Jay Inslee, and former Rep. John Delaney have all spoken out about the difficulty of meeting the threshold requirements for minimum number of donors. Those without the groundswell, or those who have relied more heavily on local support, will have to figure out how to expand their donor base before June. While this model is encouraging grassroots fundraising, it may limit who ends up on stage in June. Polling. As the Democratic field begins to take shape, a variety of polls shows the top five candidates to be Biden at 29.2%; Sanders, 21.8%; Harris, 9.8%; O'Rourke, 9.2%; and Warren, 5.7%. At this stage in 2015, the top five Republicans were Jeb Bush and Scott Walker tied for first, Ben Carson in third, Mike Huckabee in fourth, and Rand Paul in fifth place. Of note, South Bend Mayor Pete Buttigieg made the biggest jump in the past week with a 3-point climb to 4% in the most recent Quinnipiac poll, marking his highest polling numbers so far. Congressional Watch. Last week Sen. Tom Udall announced he would not be seeking a third term, opening up his New Mexico Senate seat in 2020. Today, Rep. Ben Ray Lujan (D-NM-3) announced he would be running for the open seat.